← Come Celebrate Washington County Baseball Heritage Night on June 20! A terrific storm came through our area last Saturday night, but not before the relatives of some of our Washington County major league ballplayers were introduced before the game. (See the previous post!) I had the pleasure of reconnecting with Karen Cole, one of Dave Cole’s twin daughters with whom I used to work. (For his SABR biography which I wrote, click here.) I also had the pleasure of meeting Kristi Friant, a niece of the county’s very first major leaguer, John Wilson, who pitched four innings for the 1913 Washington Senators. I was amazed that we found anyone connected to John, but as it turns out, Wilson had a long career as a coach and physical education teacher at the Naval Academy. Wilson’s inclusion in the Suns’ ceremony has caught the attention of Alan Feinberg, a Senators historian, which once again demonstrates what a small world Baseball is. 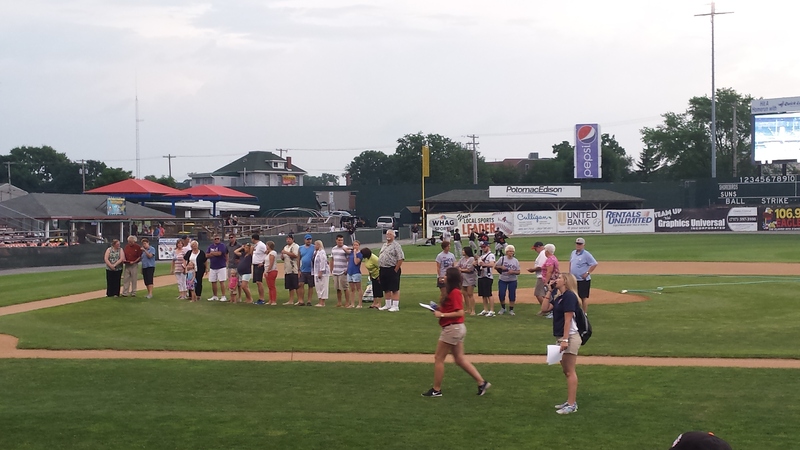 Relatives of former major leaguers from Washington County line up before the Hagerstown Suns game on Saturday, June 20. I had the ultimate pleasure that night of making it to my car before the deluge. Ah, the little victories in life that mean so much. This Saturday, Social Graces Ballroom Dance Studio, where Martha and I take lessons will hold its grand opening. The new studio, on the east end of Berryville, VA is beautiful and was refurbished almost entirely by volunteer labor. Check here for the schedule of events, which run all day and are free and open to the public. If you ever wanted to try ballroom dancing that’s the day to come give it a whirl! You can also see if my lessons have paid off as my instructor, Danielle Beaulieu and I will be giving a swing performance at 3:00. Finally, how can you tell if the guy who does your store sign suffers from bi-polar disorder? This entry was posted in Baseball in General, Uncategorized and tagged Hagerstown Suns, major leaguers from Washington County MD, Social Graces Ballroom Dance Studio, Social Graces Ballroom Dance Studio Grand Opening, stupid signs. Bookmark the permalink. Austin, do you think the pitcher from Oakland who throws left & right, had anything to do with that sign? That could be. 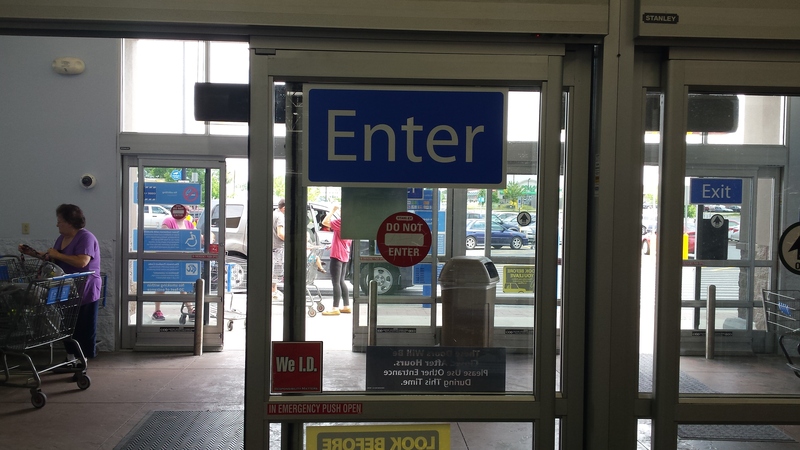 I was able to enter, but I had to walk in backwards so no one could tell if I was coming or going.